If you’ve used wood as your heating or cooking source for any length of time, then you know the key to heat production is in properly drying and storing firewood. 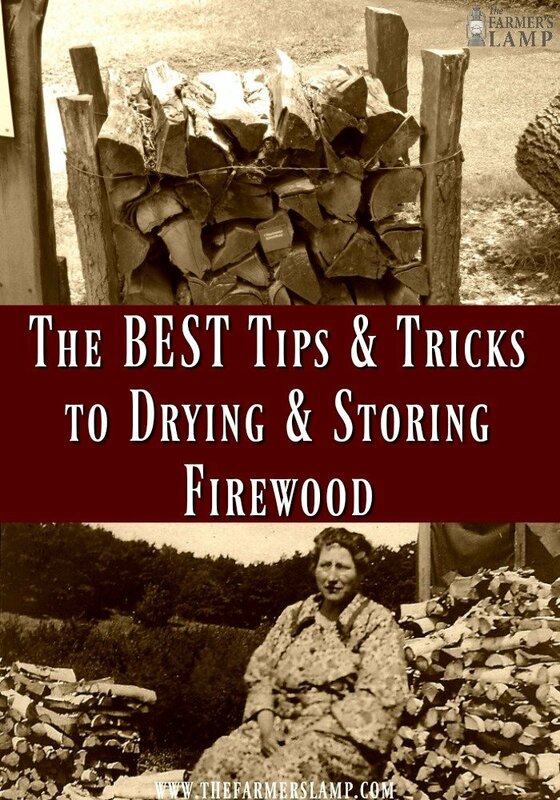 We want to share what we’ve learned with you over the years about drying and storing firewood. When J was a little boy, many moons ago. He and his siblings were bringing firewood in without gloves and his little fingers were frostbitten. Even now, he has to be careful in the cold because his fingers will hurt badly if not kept warm. Winter is fast approaching here in the panhandle of Idaho. The pass and upper elevation have already seen snow. I hope you’ve gotten all your wood stacked and dried. What’s the Difference in Green-Wood and Snag Wood? A tree that is alive when it’s cut down is called green wood. If a tree is dead when it’s cut down, it’s called snag wood. If you purchase your firewood instead of cutting it down yourself, be sure you ask if it’s been aged and for how long or is it still green. Green-wood won’t burn well, it mostly smokes and puts off little heat. 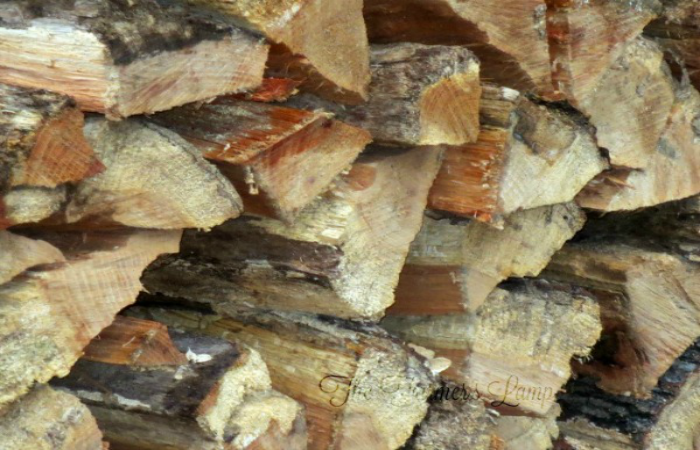 The most efficient heat will be gained from properly drying and storing firewood. You have a choice of splitting your rounds and then stacking them to dry or aging your rounds and then splitting them. The average time for wood to cure properly is 6 months to a year. It takes this long for the proper moisture level in the wood to be reached, of course, the time it takes depends on the type of tree you cut for drying and storing firewood. Papa always said, “Chopping wood will warm you twice! Once when you split it and again when you burn it.” Some people use a chainsaw to cut their wood, people who enjoy splitting wood, like my husband, use an ax and others use a powered wood splitter. I think Papa would have loved one! No matter which kind of stacking method you use for drying and storing firewood, don’t stack it directly on the dirt. Doing this puts the woodpile directly in contact with moisture. After all the time and energy you’ve put out getting your wood supply, you don’t want to lose any of it because of improper stacking. 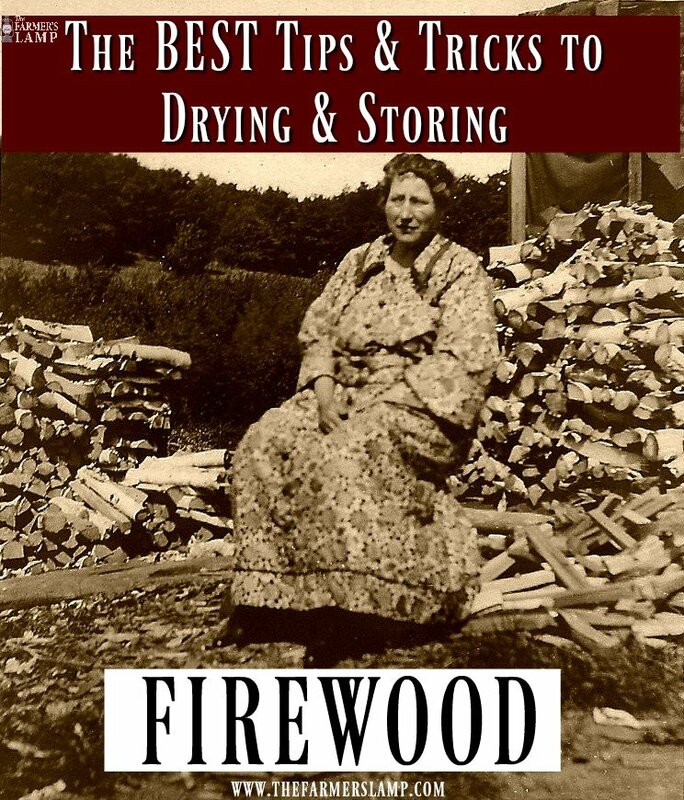 Learn from the old-timers and make good old-fashioned woodpile for drying and storing your firewood. All woodpiles are alike in that the ground where you choose to place it must be dry and level. This means the area should have proper drainage so water isn’t allowed to pool or stand under the pile. We like to do what’s called the “Straight Stack” for drying and storing firewood. Scrap pieces of lumber or pallets are what we use as the base. If we use lumber, we set two parallel rows 10 inches apart ensuring both ends of the firewood rests on the lumber boards. We also make sure the middle of the piece of firewood doesn’t touch the ground between the two parallel pieces of lumber. If we use a pallet, we stack directly on it. We usually don’t pile higher than 5 feet. I’m only 5’5” and J felt I should be able to see over it! The thing I hate about woodpiles is they bring critters. All kinds of creepy crawlies. Be sure to not stack the woodpile next to your house to reduce the chance of rodents or insects getting in. Who enjoys mice running across the floor as you flip on the lights in the morning. We won’t even talk about wood roaches that come in looking for warmth and water! Some people have a shed designated just for drying and storing firewood. You know, the proverbial woodshed? This is an excellent way to keep the wood dry but you have to be sure there is plenty of airflow for proper curing. Most wood sheds I’ve seen do this by leaving at least two sides of the shed unenclosed. 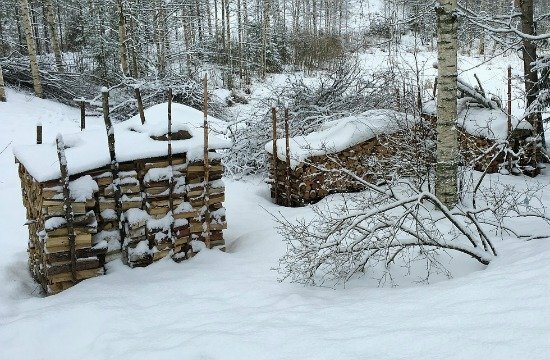 The “round stack” is another woodpile option for drying and storing firewood. The area you choose on your homestead will determine which type of stack will work best for you. The round stack is pretty to look at, I think. The round stack is accomplished by stacking the wood in vertical rows in a circle. All of the pieces point towards the middle of the circle in a starburst design. 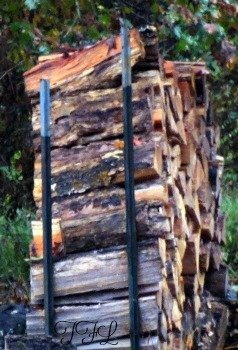 In many countries, this is the standard way of stacking for drying and storing firewood. It’s certainly streamlined, but because of decreased airflow, the drying time can be increased. Some people buy moisture meters to measure the moisture content in their wood. Just for your knowledge, the ideal moisture level is 20%. This certainly isn’t necessary and it’s not something we’ve ever done. Seasoned wood is lighter in color. Some trees even change color completely. But color isn’t the only indicator. You should look for hairline cracks on the outside surface of the wood. Seasoned wood will also weigh less and have a higher pitched sound when you knock on it. The wood must be exposed to sun and airflow for proper curing. Tree bark is a natural moisture barrier so if you expect a lot of rain, stack the wood bark side up. We do this even though we keep the wood under cover. It serves as an extra level of protection. If you expect excess moisture from the ground like areas with snow, putting the bark side down will help prevent moisture absorption from below. At least, this is what an old-timer once told me. If you don’t have a roof of some kind over your woodpile, use a tarp to cover it. Using a strong, properly sized tarp will protect your wood from snow and rain. I’ve seen woodpiles rot because the tarp was too snug. This kept air from circulating trapping the moisture inside. As we’ve learned in the last year, a properly tarped woodpile will remain dry and ready to use even with feet of snow on the ground! Do you have another method of drying and storing firewood? We’d all appreciate your sharing your wisdom and experience with us in the comments. Since we cook and heat with wood, we’ve accumulated some tips and tricks over the years to share with you. Thanks for all the valuable information. I do a lot of what you mentioned along with covering my wood but not cutting off the air flow. I put a tarp over it to greenhouse effect it to expedite the drying process. Great tip!!! Thanks for sharing. Kuddos for a well written tips from the farm. I am with you in that there was a great deal of knowledge in the brains of our forefathers. Much of what they did was trial and error, but they learned and improved on prior ways to our benefit. Thank you- my motto, if it ain’t broke, don’t fix it. We have much to learn from the ways of old.